You probably don’t want to be too strict while you are camping but you probably don’t want to get too far off track either. We’ve seen a trend of people making a real effort to be able to enjoy their traditional camping pleasure foods and incorporating some fresh, healthy options as well. 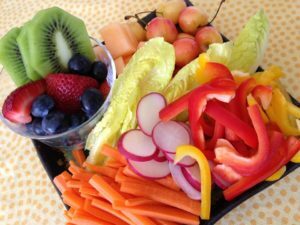 Summer is a perfect time for fruits and vegetables so keeping lots of them cut up and ready to snack on is a good idea. Kids love them and they will be extra hungry when they have been playing outside all day so it will be easy for them to grab and go. Baked sweet potatoes on the grill and seasoned veggies in foil packages are delicious and filling. Swap chicken for burger once in a while and you’ve already improved the health score of your menu for the week. Even pancakes don’t have to be given up if you use whole grain mix and add in some walnuts or pecans. Fresh fruit on top just adds to the pleasure factor and makes for a happy family around the picnic table. Most of all, stay hydrated. You’d be surprised how much you can burn off in a day and it’s easy to forget about drinking water. Much of the fruit & veggies you’re eating will help with that too. You don’t have to give up S’mores, burgers or beer to go home feeling pretty good about how you fed your body on your trip.